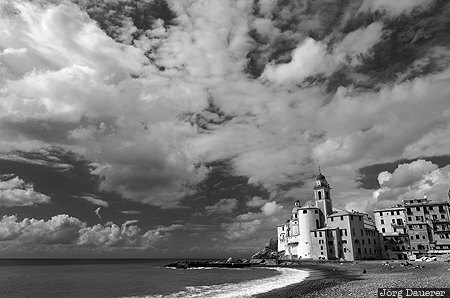 Dramatic clouds above the Basilica di Santa Maria Assunta at the coast of the mediterranean sea (at the Riviera Ligura di Ponente) in Camogli. Camogli is in Liguria in northern Italy. This photo was taken at noon on a cloudy day in October of 2012. This photo was taken with a digital camera.